For many a pilot, the North is a fundamental staging ground—emphasis on fun. It’s where you start your career, controlling aircraft where autopilot isn’t an option, taking off and landing on runways that, in other parts of the world, would be barely passable. Most importantly, it’s the place to earn your thousands of flying hours to qualify for coveted seats with either WestJet or Air Canada. And when that happens, you’ve made it, career-wise. You move back south, buy a house, and live happily ever after, or so the aviation creed goes. Peter Palme could have easily gone that way. He’s flown on four different continents and has the experience to land a well-paid gig with any major airline. But two summers ago, with just one aircraft in his fleet and one employee—himself—on the roster, the 35-year-old started his own airline, Open Water Charters. In a town where well-established names—the likes of Buffalo Airways and Air Tindi—rule the skies, he’s managed to carve out a niche for himself. From the first week of June to the second week in October, Palme is constantly busy, flying vacationing fishermen and adventuring canoeists to and from some of the most picturesque lakes and rivers in the Northwest Territories. For Palme, it’s been a bumpy, unconventional ride to get here. It’s also been a terrifically lucky one. In 2007, only three months after moving from pilot school in B.C. to Yellowknife for a job at Summit Air, he started flying the Dornier 228, a 19-passenger aircraft. (Often, new hires do admin work in the office or grunt labour on the ramp before graduating to the co-pilot seat.This waiting period can drag on for years.) Palme accumulated hundreds of flight hours looking down over stunning Baffin Island fjords, glimpsing pods of narwhals, abandoned mine sites in the NWT, and navigating through the mountainous Yukon—vistas people would pay fortunes to see. Then Summit Air got a contract with a nonprofit based out of Stanford University to do surveying work over Panama, Peru, and some of the most biodiverse sections of the Amazon basin. “So they sent me down there,” Palme says, leaning back, legs crossed, in his leather office chair in a trailer he now shares with Plummers Arctic Lodges. He’s been there all morning, buried in paperwork, despite the 20-something-degree weather and blue skies calling to him through the window. But the excitement was wearing off. It was a two-month on, two-month off contract. Yellowknife was Palme’s home base; he’d met his fiancée—now wife—there, and going back to visit meant 36 hours of travel. So, several months before his contract was up, he got to work on his homecoming plan. 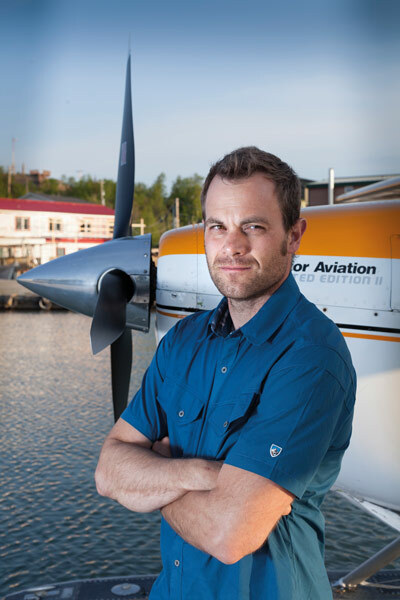 In 2012, Air Tindi sold its fleet of Cessna 185s—tiny aircraft that fit three passengers plus gear—leaving a small but significant gap in Yellowknife’s charter market. For locals, those tiny Cessnas are a relatively affordable way to get to their cabins, many of which are accessible only by plane in the summer. Fishing lodge owners often fly in their clients on Cessnas, and small expeditions on NWT rivers usually rely on a Cessna for drop-off and pickup. For months before his Voyageur contract ended, Palme was filling out paperwork through Transport Canada, and established Open Water Charters, which he hoped would fill that gap. When he returned to Canada in spring 2013, he bought a Cessna 185 from a company in Orillia, Ontario. He had some preliminary inspections done on the plane there, then had to ferry it to Fort Nelson, B.C., for a maintenance check that would clear it for commercial flying. He decided to fly it himself, offering a passenger seat to a buddy who needed a ride to Fort McMurray, Alberta. No snags on the first leg. Palme dropped off his friend and spent a night in Fort McMurray before heading out to Fort Nelson. Halfway there, he could see liquid spraying on the dashboard and smelled gas, and knew immediately there was a fuel leak. It was dripping behind him, where his friend had been sitting the day before. He spotted a campsite on the shores of a lake and managed to land on the water just fine. But when he pulled back the fuel throttle to slow down the plane after landing, it backfired, and a whoosh of fire burst through the aircraft. It was so fast, it didn’t even singe Palme’s hair or eyebrows. “It just gave me a sunburn for like two or three days,” he says. But had his friend stayed along for the ride, he would’ve been badly burned. Palme managed to climb out and stand on one of the floats. The campsite manager and his son, who’d arrived only two days before to open up the site for the summer, had spotted him from shore and started up their motorboat. They zipped out to rescue Palme, who by then was struggling to swim to shore in freezing cold water—the ice had broken up only a week before. The plane, meanwhile, was completely destroyed. It had been partially insured, but it was still a huge financial blow for Palme. (Cessna 185s can cost more than $100,000). “At that point, I was just going to throw in the towel and say this isn’t really for me,” he says. That conviction lasted for about two days. Then he thought about all the work he’d already put into his company. “In aviation, when you have a commercial company, [everything] has to be written down,” he says. “Even little things, like how you fuel, how you load the passengers and stuff like that, has to be in a manual.” He’d spent hours every day for months hunched over a desk, labouring on maintenance, training and safety manuals. It would be a shame to throw it all away. Within a week, he had another plane leased out from a different company, and after all the requisite inspections and paperwork, Palme launched his first season. In the fall of 2013, he bought his current Cessna 185 from Whitehorse-based Black Sheep Aviation. By its second summer, Open Water Charters was already turning a profit. Palme is coy about how much. “It wasn’t a lot,” he grins, but adds it was enough. A big part of his business is keeping prices affordable. (A half-day fishing trip, where he flies passengers out to a fishing spot, stays with them, and flies them back, costs $500 for three people. It’s also one of the reasons Palme keeps his fishing rod in the plane at all times.) In the winter, he flies for Air Tindi, doing medevac work, but says he makes enough in the summer that he could take winters off if he wanted to. This is the first season that Palme’s hired on another pilot and he’s planning to buy a Beaver, a slightly larger floatplane that can fit more passengers, more gear. But he still enjoys adventure and eventually, he might take off for a while. He and his wife, who’d worked with Doctors Without Borders in South Sudan while he was with Voyageur, are planning a year-long trip abroad. They plan to work for the non-profit for part of the year and travel for the rest. Though this vacation might be a few years off, Palme is determined not to let his work tie him down. And hey, it’s worked for him so far.